"Chug-a-Lug" is a song written and recorded by American country music artist Roger Miller. The song reached number 9 on the US Billboard Hot 100 in 1964, becoming his second pop hit. The song is a humorous reminiscence of youthful encounters with homemade alcoholic beverages. The expression "chug-a-lug" refers to quickly downing a drink, and the lyrics describe the singer's reaction to the extra-strong liquor. Example: "I swallered it with a smile / (sound of swallowing) / I run ten mile! Chug-a-lug, chug-a-lug / Makes you want to holler, 'Hi-dee-ho!' / Burns your tummy, don't ya know / Chug-a-lug, chug-a-lug." Miller said that the song was based on a true story of a friend of his who "could drink a beer in 3 seconds. The British group The Swinging Blue Jeans included the song on their 1966 Canada Capitol album Don't Make Me Over. The song was recorded on the Kentucky Headhunters' 2005 album Big Boss Man. This song was re-worded and used for the theme of the Hey Hey It's Saturday segment Plucka Duck. Country singer Toby Keith included a live version on the deluxe edition of his 2010 album Bullets in the Gun. A reworded version was used in animated advertisements for "Milk Chug" single-serving milk bottles. ^ Whitburn, Joel (2008). Hot Country Songs 1944 to 2008. Record Research, Inc. p. 278. ISBN 0-89820-177-2. 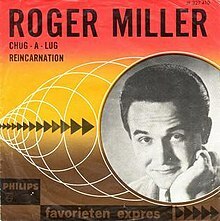 ^ "Roger Miller - Chug-A-Lug (Vinyl)". Discogs.com. Retrieved 2016-09-27. Roger Miller Featuring Dang Me! "Mine is a Lonely Life"
"You Don't Want My Love"
"It Happened Just That Way"
"I've Been a Long Time Leaving (But I'll Be a Long Time Gone)"
"You Can't Rollerskate in a Buffalo Herd"
"My Uncle Used to Love Me But She Died"
"The Ballad of Waterhole #3 (Code of the West)"
"Where Have All the Average People Gone"
"The Tom Green County Fair"
"Lovin' Her Was Easier (Than Anything I'll Ever Do Again)"
"We Found It in Each Other's Arms"
"Sunny Side of My Life"
"I Believe in the Sunshine"
"Everyone Gets Crazy Now and Then"
"Some Hearts Get All the Breaks"
This page was last edited on 21 November 2018, at 02:13 (UTC).